10 kW Induction Generator operating at 25 kHz heats a 2.5" ( 65mm) diameter (nominal) tool holder in 3-5 sec's. 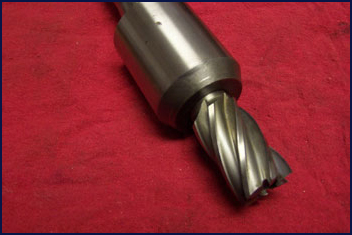 Tooling is shrink fitted such that at 20,000RPM the end mill and tool holder are well balanced. The Power Supply Cabinet can be mounted up to 10 meters from the Heat Station. The Heating Coil is designed for maximum efficiency, utilizing heavy copper bus bar leads, square heavy wall copper tubing and is water-cooled. System efficiency is high as a result of auto-tuning electronics that match operating frequency to the heating load. A Quick-change Heating Coil Adapter is offered when heating coil changes are frequently required for different sized Tool Holders. 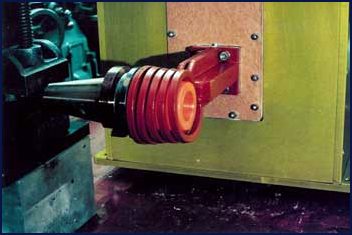 Use our IGBT Induction Heating Generator for all your Shrink Fitting applications.